In a democracy, to be denied a voice and a vote simply because of the body one happened to be born into is among the greatest injustices imaginable. A century ago we began the process of correcting that injustice for women, and great progress has been made: from extending the franchise to all, not just property owners, to giving 18-year-olds the right to vote, and the growing campaign for votes at 16. But today the great determinant of the power of your voice and vote is geography. That is because of the out-dated first-past-the-post electoral system. It is an anachronistic system in which a plurality of votes in a small geographical area grants one a monopoly of political power, both in an individual constituency and across the country. It is a system that can turn a narrow plurality into an overwhelming majority. And because of that it is dangerous for our democracy. It feeds people’s sense of disenfranchisement, disillusionment and disenchantment by making them question why they need bother vote when the same party always wins in their constituency. As it stands, in the last election our voting system made a difference in only 99 of 650 seats. The link between an MP and their constituents is vital, and so preserving that link in a proportional system is vital. We like to know that our community has its representative, fighting our corner in Westminster. And election campaigns are fantastic because, as an MP, your constituents get to see you out on the doorstep, arguing for their vote. And whilst I’m deeply proud of the fact that I secured 68 per cent of the vote in my Aberavon constituency, the highest share of the vote anywhere in Wales, my team of brilliant activists and I do not take a single vote for granted, which is why we are out on the doorstep between elections, not just in the campaign. Nevertheless, there are many seats across the country where that work on the ground is not put in right across the constituency, and there are places where the winning candidate is elected on under 50 per cent, and in some instances with under 40 per cent of the vote. That cannot be right, and it makes as much of a mockery of our democracy as the old rotten boroughs did. If the electoral system is designed in such a way as to give a national majority on a small plurality of the votes, then it should come as no wonder that on the doorstep many of us have been asked what difference their vote really makes if nothing ever changes, and their MP never represents them and their vote. There are very few walks of life in the 21st century where you are given a binary choice. But in the most recent general election, over 80 per cent of the public in 2017 voted for one of two parties. An estimated 20 per cent of the electorate voted tactically on the basis that first-past-the-past forces them to vote for a party that they don’t really like, just because that’s the best way of keeping out the people that they really hate. As a voter, you should never be voting for the “least worse” option – you should be voting for the party that you feel passionate about, and that is precisely what a proportional representation would provide. It would energise and create a new electoral landscape, one where voters across the country, and not just those in a select few swing seats, have real choice and belief that their vote could lead to meaningful change. Proportional representation would also have a significant impact on political engagement. Turnout in the vast majority of cases in proportional systems is substantially higher. Denmark’s last general election in 2015 saw a turnout of 85.8 per cent; one needs to go back as far as 1950 to see something similar in Britain. Such is the nature of their voting system that all voters are acutely aware of the reality that literally every vote counts, as seats are allocated on the percentage of the vote won by each party, which drives engagement because everybody knows that their vote really matters. At present, a lot of people, particularly from the older generation, will cite the fact that their parents and grandparents fought and died to protect our democracy as what compels them to exercise their moral and civic duty and turn up and vote. Now however, we are seeing younger people coming through for whom these values are distant. Though many are intensely political and engaged, younger citizens want to see that their vote count, feeling demoralised in the face of a voting system that makes them see their vote is pointless as “it’s always been the same guys around here”. Though there may be some secret supporters amongst them, at present it appears there is not a single Conservative MP in favour of proportional representation. This means that the Labour Party is the only realistic vehicle for the seismic democratic change required to reform the voting system. Myself and others must continue to make the case for proportional representation both to the public and within Labour. The last huge progressive change we had in our democratic system was giving (some) women the vote back in 1918. Back then a lot of people predicted the sky was going to fall in – and to no-one’s surprise what we have seen is the opposite. It was one of the best and most progressive things that has ever happened in our country and now 100 years later it’s time for us to make that case again for voting reform. Those women that campaigned for their suffrage, some of whom gave their lives for the cause, wanted to see a democratic system that worked for everybody and delivered governments that would actually bind our country together and lift our people up together. As a progressive party, Labour is a party of reformers by nature. The argument of “well, it’s the system we’re used to and we’re going to stick with it”, is as antiquated an attitude as that which said to Attlee and Bevan that we can’t build the NHS, as antiquated and out of touch as that which said to Blair and Brown that we can’t introduce the minimum wage, create Sure Start or save our NHS and schools from 18 years of Tory neglect. If we just shrug our shoulders and accept that the status quo is what it then we would be betraying the historic mission of our Party as the great party of change and progress in Britain. And that is why I’ve been fighting for a manifesto commitment to proportional representation. The 2017 manifesto on which I was re-elected pledged Labour to establish a “constitutional convention to examine and advise on reforming of the way Britain works at a fundamental level”. In our next manifesto we must be true to our historic mission and inner radicalism, and commit to placing electoral reform at the heart of that convention. And we should be pressing other parties to make that very same commitment. If we really want to build a new and better kind of politics, what could be a better start than a cross-party, shared manifesto commitment to electoral reform and a constitutional convention? That is how we can show that we have more in common rather than just paying lip service. The great problem of referendums is that you never really know if the question being answered is that on the ballot paper. The 2011 AV referendum wasn’t, in the end, about electoral reform at all: it was about giving Nick Clegg a bloody nose. But the purpose of a constitutional convention is clear and unambiguous. It should be time limited and bound by statute to report and recommend anew electoral system, along with other reforms to modernise a political system that is in danger of crumbling as fast as the Palace of Westminster itself, which would then be voted through and implemented in parliament. Proportional voting systems, such as those used for elections in the Welsh Assembly and Scottish Parliament, have been in place in 1999, providing a good blend of constituency MPs mixed in with regional MPs elected on via a party-list. Just as was the case with life after women’s suffrage in 1918, democracy has thrived and the world has not spontaneously combusted. Today we need all reflect on the extraordinary courage and tenacity of the Emmeline Pankhurst and the suffragettes, and bring this into the last great struggle of British democracy: making every vote matter. Stephen Kinnock is MP for Aberavon. Politicians and musicians are marking the centenary of Women’s suffrage by carrying out a hunger strike to highlight the need for voting reform. 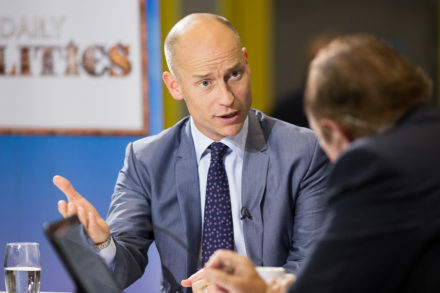 Stephen Kinnock will discuss voting reform at The Article Club debate on 28th February, 7.30pm.